Mestre Didi (1917-2013) by his friend photographer Mario Cravo Neto. Courtesy Christian Cravo. At the 2017 edition of SP-Arte—the most lively, eclectic and beautiful yet—I was drawn, like magic, to the sculptures of Mestre Didi. After a good fifteen minutes taking notes at Paulo Darzé’s booth, I overheard one of Brazil’s star gallerists, a professional whose long trajectory and artistic punch I admire, negotiating for a work of Mestre Didi for his private collection. Mestre Didi, Xaxará de Omolu, 1960, palm fiber, painted leather, glass beads and cowrie shells, 45 x 12 x 12cm. Originally from the Carybé Collection and reproduced in his book, since 2014 at the Catherine Petitgas Collection. Photo Andrew Kemp. 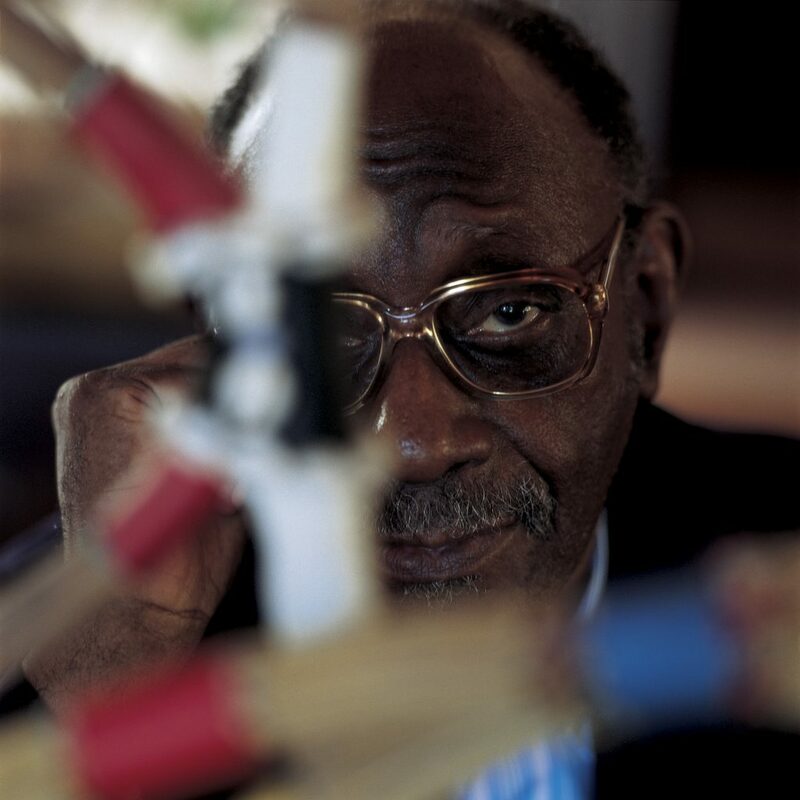 Less than six years before the artist’s death, Paulo Darzé Galeria de Arte in Salvador, Bahia, exhibited the sculptures of Mestre Didi at the 2007 edition of SP-Arte for the first time. In October 2014, gallerist Darzé took his old friend’s work to Frieze Masters in London. The bold move proved fruitful. “Over half the exhibition was sold, two works went to collector and patron Catherine Petitgas, Darzé told me while I was mesmerized by the twenty-five sculptures on show for the second time at SP-Arte, at this year’s event. 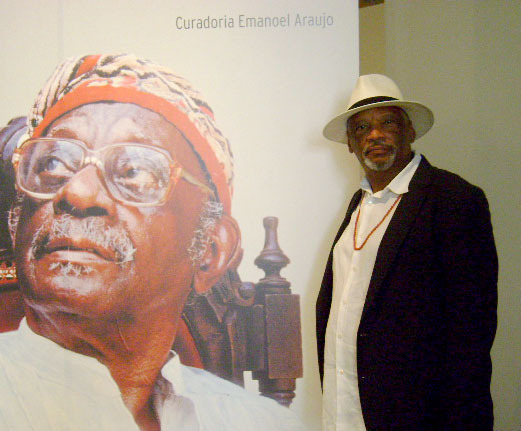 What follows is an interview with Emanoel Araújo, diretor-curator and founder in 2004 of the Museu Afro Brasil, housed in São Paulo’s Ibirapuera Park next to the Bienal. 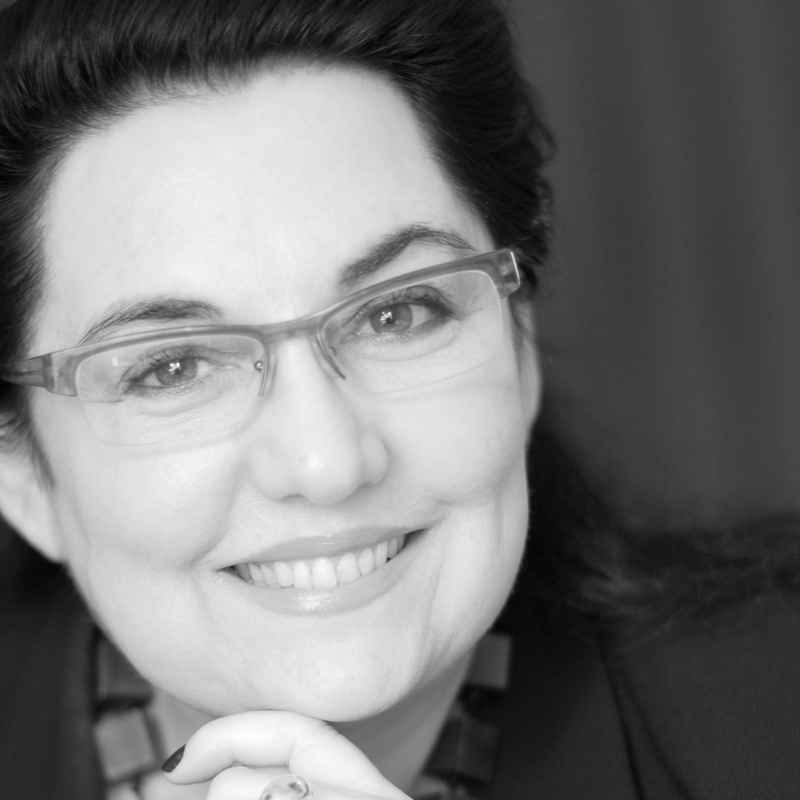 Before that he was director of the Pinacoteca Museum and Secretary of Culture of the city of São Paulo. As well as being a close friend of the late Mestre Didi and a specialist and collector of his oeuvre, Bahia-born Araújo is also an acclaimed artist and intellectual of Afro-Brazilian culture. He wrote the introductory text in the catalog of Mestre Didi’s works on show at 2017 SP-Arte. 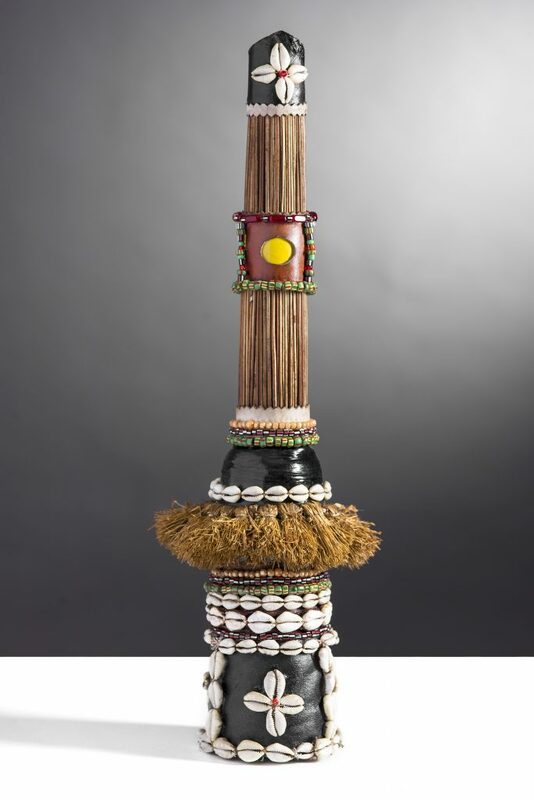 Mestre Didi, Emblema Africano (African Emblem), 1976, palm tree fiber, colored leather, cowrie shells and glass beads, 175 x 48 x 25 cm. Photo Andrew Kemp. Courtesy Paulo Darzé galeria de arte, Salvador, Bahia. Emanoel, how is it possible that the sculpture of Mestre Didi is able to weave art and religion as well as Africa and Brazil all in one? The amalgamation of different religions, known as syncretism, has bestowed upon Brazil’s cultural fabric a decisive imprint especially in the domain of the sacred representation of the myths of the Nago-Afro-Brazilian culture, exhaustively studied by experts in ethnology and ethno-esthetic. In his writings, essayist Abdoul Sylla from Senegal explains that through this perspective the African man and woman believe that traditional African art can bridge the gap that separates the real world (living creatures and things) from the unreal world (the dead, the ancestors, deities and myths). Mestre Didi was a legitimate representative of his Yoruba origins. The Youruba believed that the world had been created and flourished through an artistic force. Mestre Didi’s oeuvre constitutes this symbolism with its religiousness, its inventiveness and its freedom. It derives from this creative and transformative halo that involves the Yoruba nation’s set of beliefs based in a sense of esthetics and beauty with the corpus of materials from Mother Nature. What is the magic in his sculptures? His sculptures are ingrained with mythological interpretations and highly inventive forms, rhythms and compositions. They are articulated to challenge the balance of a totemic representation and embrace space like trees planted in a concave circular base. The elegance in the way his vertical objects are constructed drives them into space in an act of pure gestural expression. The graphic compositions are alternated rhythms on the sculptural body. They are made by multiple lines encircled by golden rings and vibrant colors that tie up the palm fibers reinforced by strands of glass beads and embroidered with cowrie shells. These vertical mast-like forms—Sasaras, Ibiris, Ofas and Opas, as he called them—all belong to Mestre Didi’s iconography which is tightly woven into Afro-Bahian sacred art. 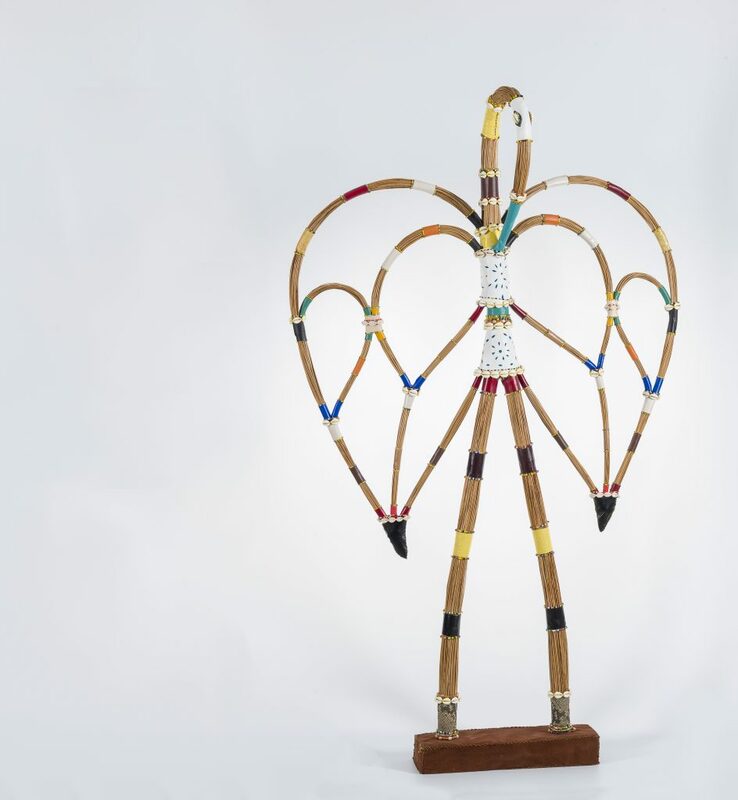 Mestre Didi, untitled, n/d, palm tree fiber, leather, cowrie shells and glass beads, 73 x 20 x 25 cm. Photo Andrew Kemp. Courtesy Paulo Darzé galeria de arte, Salvador, Bahia. How do you analyze the fact that the sculpture of Mestre Didi is also imbued with contemporary expression? The deep emotion in his work is transmitted even when one is unaware of its subjacent meanings. The viewer is overcome by a poetic energy both ancestral and contemporary of universal character. Mestre Didi was inspired by the sacred symbolism of his people, his esthetic concept projects a singular sensibility based on a technique woven in profound mysticism webbed with tradition and contemporaneity guided by his existential creativity both as a holy man and an artist. The work of Deoscoredes Maximiliano dos Santos, known as Mestre Didi, is inscribed in the mythological dimension of art. It is precisely the total independence and originality of his oeuvre that inscribes his work in the vanguard of the arts.